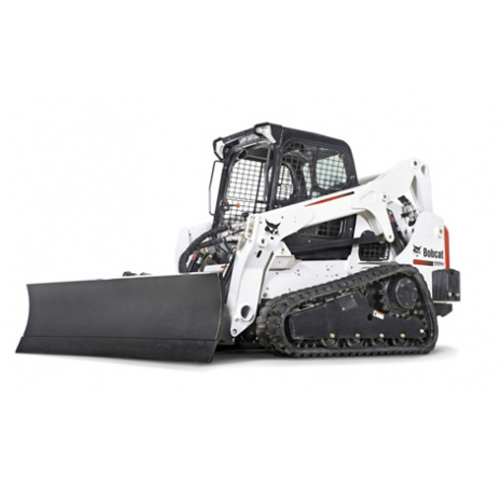 The Bobcat 800 series loader models are the largest loaders Bobcat has ever manufactured. The new compact tracked loader model T870 belongs to this new platform that is larger and longer than the current large frame loaders (T300/T320). These new loaders offer significantly improved visibility, improved pushing power, more powerful hydraulics, increased fuel capacity, best-in-class comfort, higher rated operating capacities, higher horsepower and more uptime protection and are designed especially for the highest productivity demanding applications. The new cab offers 30% more visibility all around the loader. The 5 cm forward positioning of the cab places the operator closer to the attachment. Forward visibility is further enhanced thanks to a 45% larger door and a lower front cross-member on the cab. Also contributing to improved visibility is a 50% increase in the output (total wattage) of the front work lights. There are two bulbs instead of one as in the past. The side and rear windows offer more visibility. The lower side screen has been enlarged by more than 15% to improve visibility to the tyres or tracks. The rear screen and cooling unit have been lowered. Together with a 14% larger rear window, this new design significantly improves visibility to the rear of the machine. Bobcat customers requested a more productive compact loader for the most demanding applications. With the 800 series loaders, we achieved this increase in performance through a combination of factors. Engine power has been increased by 8%. The new generation loaders are powered by the 4-cylinder 3.8 litre Kubota V3800 DI-TE3 turbo diesel engine which delivers 74 kW (99 HP) on T870 (SAE JI995 gross) at 2600 RPM. The engine power and the increased weight of the machine ensure that the tracks deliver best-in-class pushing power. Lift height has been increased by 12% on T870, enabling the machines to load the biggest trucks or to operate easily and more productively in tankers for ship trimming applications. Digging power has been increased by 12% on T870 (vs T320). On the 800 series loaders, the charge oil is cooled rather than the implement oil. This allows for a much steadier flow rate through the oil cooler as it is not affected by hydraulic attachments in operation or moving cylinders. Since the oil cooler is optimized around a set flow rate and not subjected to pulses when running a hydraulic breaker, it can be made of aluminum. 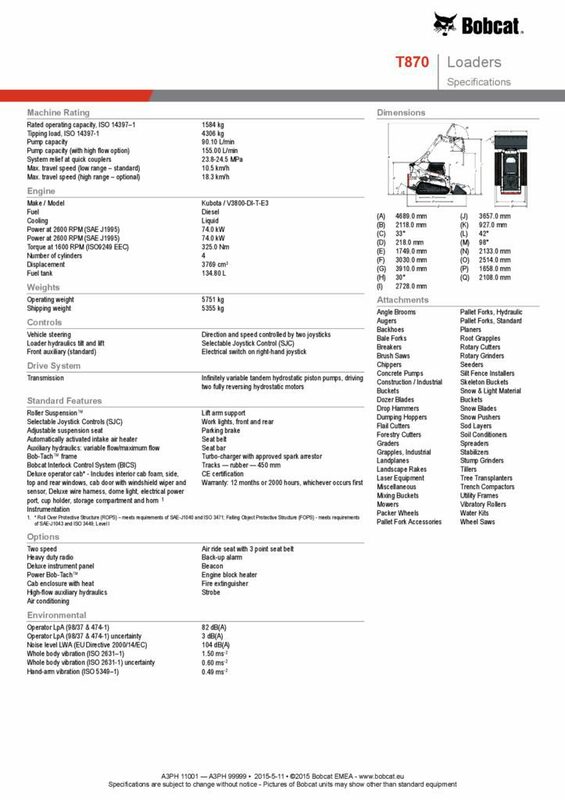 All routine maintenance points are accessible from one side thanks to the transversal engine, while the large swing-out tailgate provides access to engine check and fill points, filters and battery.